The ten nominees for the 2012 storySouth Million Writers Award have been posted. Check ’em out, give ’em a read, and vote for the best one. Somehow I fear I am the last person in the world to know about the Underground New York Public Library. I have been waiting for the Internet to get this right. It took a few tries. People Reading cracked open the idea of showing folks enjoying books in public, and included interesting follow-up inquiries to willing participants, while CoverSpy emphasized the Book Cover Bingo aspect, with unseen readers reduced to mysterious police descriptions (“F, 20s, rolled-up jean shorts, peach tank top, big blue backpack, Union Square”) with the occasional revealing act of character (“M, 50s, yellow Nike shirt, balancing Diet Coke on book, Grand Central”). 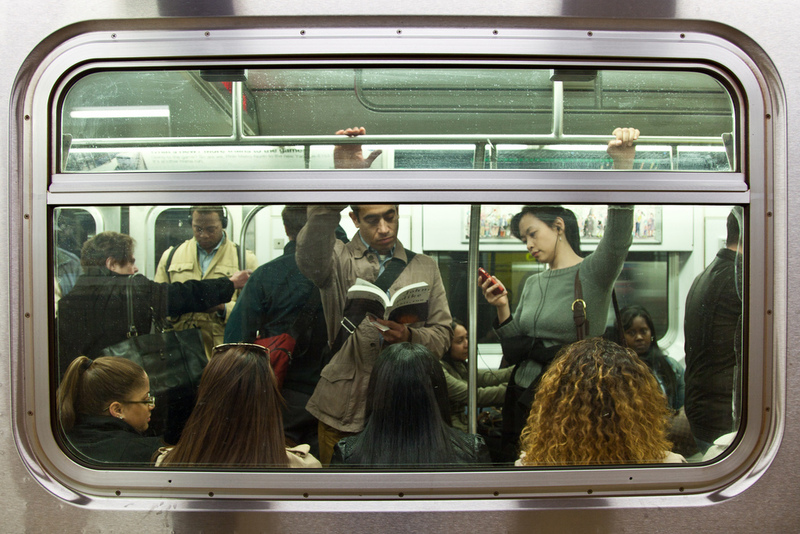 But the UNYPL catches people wholly unawares, immersed in the peaceful act of reading, while trains speed and rumble through tunnels and people bump through aisles and talk on phones and announcements blare overhead. Working on crowded Metro trains and platforms with a Canon (not an iPhone, so no locker-room subterfuge going on here), Ben-Haim demonstrates an impeccable ability to frame the shot (a number are taken through windows, some of the train on the next track over) and, I imagine, split-second timing. She doesn’t zoom in on her subjects, so often we see them in a grander context, their bored fellow passengers (chatting on their phones; staring into space) being the chaos from which they seek asylum. Also impressive is the fieldwork that Ourit does to identify the title that the person is reading, even linking to the correct edition on Amazon (when possible). For titles she cannot identify, she enlists the help of the Tumblr community in a Friday post. Ourit admits on her Common Questions page that, while perfectly legal, there is an “ethical gray area” to photographing people in public without their permission or awareness. “I’m not running amok taking photographs without any regard for my subjects,” she says. “Street Photography is a complex art form with its own subtle language of communication. I listen to cues when I see them and I present my subjects respectfully.” The splendor of the subject’s faces seems to affirm that objective. In the age of eReaders, the game of Cover Spying threatens to become stripped of its serendipity and mischief (Ourit includes a Friday eReader photo as a wry acknowledgment of this), and that is probably why the UNYPL has acquired a loyal following. It completes the act of people watching to which we all subscribe when we find ourselves idle, wishing we in a story somewhere. You are currently viewing the archives for July, 2012 at Neil Serven.